This is what my sewing machine looked like on Friday afternoon. I am finally working on blocks for my sister's quilt. I pulled the fabrics a few months ago and could not think of a quilt design. I finally settled on a "Timeless Treasure" free pattern that had been sent to me in the mail - a very simple block style. There are over 100 blocks to make the size quilt she needs, so this isn't going to be completed too quickly! I wrote in my last post that I was going to slow down - I kind of wore myself out by making four softies, a charity quilt top, a bee block, and an entire quilt - all in about one week. Consequently, there was too much not getting done in my home and I want to maintain some sort of balance for the sake of my family and my own sanity. (Lately Gregory has been skipping some naps - so my free time has been limited anyways!) I find it difficult to not just sew whenever I have a free moment - but life's responsibilies come calling and you can only ignore a dirty floor for so long. It's always a juggling act for sure. Last week I went on a trip with my mother and sister to Orlando. We went to the "Wizarding World of Harry Potter" and several Disney theme parks. Our whole family enjoys the Harry Potter series but we are not fanatics. After this post, however, you might believe at least one of us is a little nuts for the series. My sister Emily bought a few things at the Harry Potter section of the theme park and asked if we could make a bag before she returned to CO. Upon completion, I was happy to remind her that she could definitely state she had made her bag because she really did at least 50% of the work. She did all the cutting, seam ripping, ironing, hand sewing, etc. She bought duck cloth from Joann's - which is pretty sturdy stuff - I broke two sewing machine needles while making it. The ribbon on the strap used to be a lanyard which is supposed to be used for pinning a bunch of theme park pins on it. We found this cute owl button that looked nice outside the cell phone pocket. I couldn't resist a corny picture with Gregory's Harry Potter doll. This former UFO had been sitting in my closet simply waiting for a binding. I am sending it to a friend who just had a baby girl. Believe it or not, I still have some Freshcut fabric I need to use up. It was the first "modern" collection I had ever discovered and I went a bit overboard. I finished this quilt a few weeks ago. It was my first attempt at free motion quilting. It was originally intended for Gregory's birthday but now I guess I will save it for a different occastion. A few weekends ago, I came home with a vintage patchwork quilt. I was really unsure of whether I should buy it. (Nick told Gregory, "Your mommy likes to make quilts but then she goes and buys them.") But I just couldn't leave there in a crumpled heap on the owner's driveway - it didn't hurt that they only wanted $20 for it either. The owner explained that her husband's grandmother had made the top many years ago and about 15 years ago, she had backed it and hand quilted it. The handwork is well done and I love the scrappy look. It is rather large, you can get a better idea from this picture on how big it is (picture taken just as it fell to the ground). 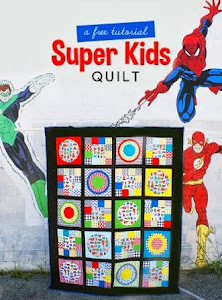 Even though I love bright, modern colors - I really like older quilts too. I used to browse for old quilt tops on ebay a lot - it's fun to see what is out there. My baby turned one today! I feel so grateful for the happiness he has brought to our lives. This child is OBSESSED with these store bought blankets. He received the blue one from a friend at his baby shower and became quickly attached to it. It wasn't long before I decided getting an identical one might be wise. He gets really excited when he gets to drag both of them around. In an effort to convert him to one of the quilts I have made, I backed his birthday quilt with a "soft and cuddly" fabric from Joann's. 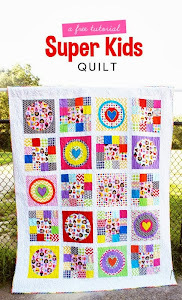 The quilt pattern is "Simply Modern Baby Quilt" by Elizabeth Hartman. I just really love this whale fabric - it's "Urban Zoologie" by Ann Kelle and it became my jumping point for all of his presents. I didn't get any really great pictures of him wearing his new p.j. 's - but they did come out well and I plan on having him wear them frequently! We had a great day today with lovely weather, a trip to the park, and chocolate cake. What more could anyone ask for? The reverse applique on this leaf quilt was quite impressive! This Muppet quilt looked very cute - at least the parts of it that I could see. I didn't really understand why they crammed so much on top of some pieces. Here's Gregory and I at the display of the biggest pumpkins. The one directly behind us was over 1,000 lbs. I enjoyed the fair but the crowds were out of control - trying to push a stroller around was no easy task. I also felt like more space and attention should've been given to crafters, 4-H, etc. rather than all the vendors and rides. I really like the "old fashioned" elements of a state fair and could pass on the over-emphasis on the commercialism of the event. Last Thursday I braved Boston traffic and drove to the Brookline library to meet with my friends from NEMQG. I got there an hour later than I wanted to due to Gregory being sick with a cold and my husband being stuck in traffic.... Not long after I finally arrived to our little get together, an elderly gentleman came into our room. He was hard of hearing and obviously a bit confused. It wasn't long before he helped ourselves to our cake: I had to take a picture. Monet, Rebecca, and I were all able to give our bee blocks to Jill, here they are all together. I think they look awesome and Jill doesn't even have to add sashing, if she doesn't want to.